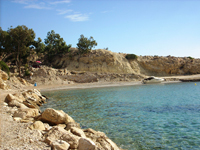 With a coast line of 23 km, El Campello offers a varied and attractive coast. Next to the port and in the old fisherman’s area, the Carrer la Mar beach, regenerated with fine golden sand, runs parallel to the pedestrian promenade. This promenade, together with the port walk, form the leisure and entertainment centre. Finally Muchavista beach extends to the south along more than 3 km before merging into San Juan beach. And at its extreme north there are cliffs and secluded coves with translucent waters. The defence and preservation of our coasts has received the blue flag recognition, and thanks to the environmental management system of the Beaches and coves hold the ISO 14.001 and ISO 9.001 Certifications for the environmental quality, for the quality of its waters, the upkeep and cleanliness of its surroundings and for its services and facilities. This extensive collection of beaches, together with some exceptional climate conditions throughout the year make this enclave an ideal place for doing all kinds of water sports developed by the Club Náutico and association and businesses specialising in fishing, scuba-diving, windsurfing, … see link. Muchavista beach is an extensive and long fine, golden sand beach with an extension of 3300 meters and 80 meters wide. As with Carrer La Mar beach, it has received the Blue Flag recognition from the European Community. 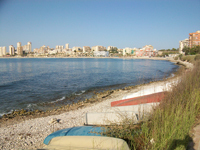 It is located in a semi-urban area next to San Juan beach, a privileged location for bathing, doing water sports such as windsurfing and walking or running along its pedestrian promenade more than 3 kms in length, which runs next to the modern and convenient tram line which links Alicante and El Campello every 30 minutes. It also has an “accessible beach”, section for people with reduced mobility. During the summer months it offers a complete programme of activities such as cinema, sports, beach library, playroom,… which, together with its tourist installations and infrastructures, make it a suitable destination for all tastes. In the northeast corner, we find that the fusion of this stretch of coast with the beach Muchavista, form a beautiful place where small boats are resting on the edge. By Tram (from Alicante): Tram Stops: Carrabiners, Muchavista, Les Llances, Fabraquer and Salesians. By bus 21 (from Alicante along the coast): Bus Stops: Avenue Jaime I El Conquistador. At the end of the promenade, near the mouth of the Rio Seco, you can find the “Punta del Riu” Beach where, in the late 19th. Century, the first shipyard was built. This was the germ of a fishing industry emerging that led to El Campello to be one of the most important fishing fleets in the Mediterranean. The memory of that fleet still stands thanks to the fishermen brotherhood because they held an auction of fish to the public from Monday to Friday afternoon all along the year. *Area for the presence of animals during the period from all along the year. The Carrerlamar Beach is the central beach of the municipality. Located next to the old fisherman’s area near ‘La Illeta’ watchtower, the port and Yacth Club, it is today the tourist centre of the town. It has a length of 1,850 m and a width of some 30 m. Recently regenerated, its sands are fine and golden, and the characteristics of its shoreline (shallow for a long stretch) make it perfect for families with children. Along the length of its shoreline runs the El Campello Promenade this is very lively in summer and winter due to the multitude of restaurants, ice-cream parlours and businesses which are located there. It has received the blue flag recognition from the European Community. During the summer, it offers all kinds of recreational activities, Beach Library, children's entertainment, etc. Special mention to the "“Virgin of Carmen Festivities",around the 16th of July, which is a emotional and traditional popular celebration in honor of the Virgin of the sailors. All of this, make a perfect holiday experience. This area, at foot of the 1st. sailor quarter, “El Trajo”, has among its attractions the presence of one of the parts of the sculpture known as “Monument al pescador” by Arcadi Blasco, 1991, that symbolizes the union of the sea with the people of El Campello. We call “Illeta dels Banyets” all the swimming area located around the Arqueological Site of “La Illeta dels Banyets”, It consists of a rocky platform and a small creek stone that link artificially the site to the mainland. It is a perfect place for diving. Behind the Yacht Club, la Bassa de la Reina (pool of Queen) is located next to the Arqueological Site of “La Illeta dels Banyets”. It is a rocky platform who is surrounded of a beautiful legend that tells how people believed that it was a swimming pool for a Muslim Queen, when the Muslims lived here,… However, it is a Roman fish farms, where nowadays you can enjoy a clean and crystalline water. CBesides, this place havs a Snorkel Route “Los Baños de la Reina”, to everybody who likes diving and knowing our marine flora. Almadrava Beach is a small semi-urban beach 600 m in length. It is made of sand and pebbles and it is located very close to the Archaeological Site of “La Illeta dels Banyets”. It can be reached by a beautiful walk which runs along the coast, the “Voramar de les Escultures” three work of art by Vicente Ferrero. Llop Marí Cove is a small beach of rocky. 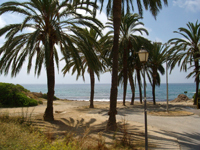 It is located in the north of El Campello, between l´Almadrava and l´Amerador Beaches. It is very nice to dive in due to its rich fauna, flora and geology. It has cavities with high environmental and landscape value. It is a rocky platform that it was an old Roman quarry. It is a nice place to people who like diving and legends because it is told that Berber Pirates (they used to attack our territory during the 16th. CenturyI) accessed through this cave and saved their treasures inside the mountain “Cabeçó d´Or”. Amerador Beach is a semi-natural beach of gravel and quiet water with 800 meters long and 20 meters wide. Morro Blanc Cove is also known as “Coveta Fumá” by the neighbourhood. This cove of coarse sand has shallowness and offers wonderful conditions for spending a day in family. Due to its clean water and its flora and marine fauna is a perfect place for diving. D’Enmig Cove is a remote, coarse sand cove surrounded by two cliffs which help to create an intimate and peaceful atmosphere. Located in an area which is not very developed, it is easily accessible both by car and the Alicante – Benidorm Tram. Piteres Cove is a coarse sand and clear water creek. It is perfect for diving and water sports. 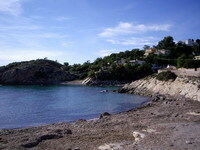 Barranc d’Aigües Beach is a natural beach, of stones and gravel. It is located in a natural protected park with great valour: “Platja de Les Llomes de Reixes”, at the foot of ‘La lloma de Reixes’ Watchtower. *At the end of this beach, getting there by Llomes de Reixes Beach, theres is a zone where the presence of animals is allowed all the year round. Formerly known as the Cala la Merced or El Portet de la Merced. It has a small port that contributes to give a rustic and traditional air. Lanuza Cove is a fine, golden sand creek situated next to the Merced port. Its calm water is much appreciated by families with children for swimming during the summer months. Les Palmeretes cove is a small natural creek of stones and gravel with crystal water. It is a perfect place for bathing, diving and/or fishing and besides, it is not very busy so that it has a lot of privacy. It is known with this name due to its palm trees that grow in the entry of the creek. 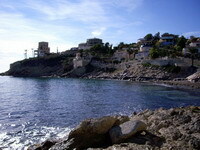 El Campello shares this cove with La Vila Joiosa. It is a coarse sand and gravel creek of a great environmental value.